Following UK Prime Minister Theresa May's presentation at the EU summit, German Chancellor Angela Merkel highlighted that both sides had work to do in preparation for the eventual Brexit talks about transition and trade in December. She highlights that negotiating a transition and future relations between the EU and the UK will be far more difficult and time-consuming than the four divorce topics: financial settlement, citizenship rights, Irish border and immediate Brexit transition. In Citi's long-held view, the Article 50 period will not be enough to settle this and negotiations will continue during the transition. The outlook for Europe ex-UK equities remains positive despite renewed political pressures. The European GDP growth rate of around 2% – led by Germany at 2.4% – is contributing to a strong pickup in earnings growth, across sectors. On the other hand, this political backdrop will likely be challenging for UK assets. 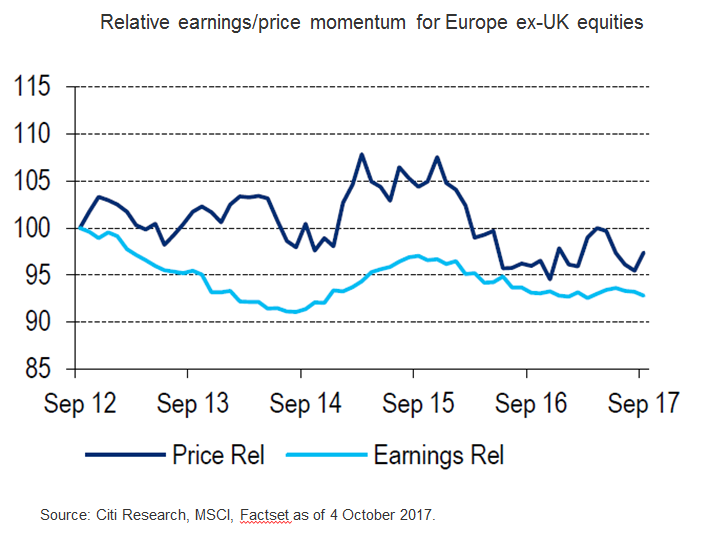 Citi analysts are underweight mid-cap equities that are mainly exposed to domestic sectors Blue chips mostly offer good dividend yield support and overseas earnings, but could face more volatility as sentiment moves with Brexit-related headlines. Meanwhile, Citi analysts believe the GBP is not expected to rally sustainably until the UK has a clear long-term roadmap. The currency is likely to range-trade before that and may retest post-Brexit lows if the EU negotiations don't progress over the coming months.